Well, it's been about a year since my wife and I brewed up up first batch of homebrew (you can read all about that saga starting here), and just yesterday we found the time for our follow-up. The last batch was somewhat of a failure, and we still have a lot of it sitting in bottles waiting to be poured out, but we're still optimistic about this batch. We learned a lot of lessons last time, and this time we set out to address each problem we encountered. For this batch, we decided to go with an India Pale Ale, and due to a lot of turmoil over the last few months, light-heartedly settled on the name FML IPA (if you're unfamiliar with the initials FML, let's just say its shorthand for a feeling of hopelessness). For our recipe, we picked one from Charlie Papazian's The Complete Joy of Homebrewing called "Palilalia India Pale Ale." We made some modifications based on what was in stock at the local homebrew store, and with the intent of kicking the intensity up just a little. Despite the poor results last year, we were a little more adventurous this time, opting to go with malted barley, dried malt extract, and hop pellets, instead of the pre-hopped liquid malt extract and sugar we used last time. While we were waiting for the PBW to do it's thing, we started the brewing process. Up first was the mini-mash, where we steeped the malted barley. 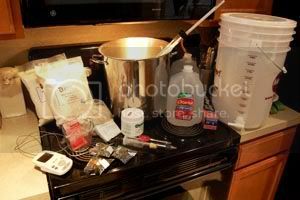 We added roughly one and a half gallons of drinking water to the kettle, and added the steeping bag full of malted barley. We brought the temperature up to about 160 degrees and held it there for around 30 minutes. After 30 minutes, the bucket, and everything inside were ready to be rinsed off and the steeping bag was ready to be removed. We used the (now clean) brewer's spoon to agitate the steeping bag to help get all of the sugary goodness out. We removed the steeping bag from the water and allowed it to drain, and then pressed it against the side of the kettle to get as much water out as possible. We then poured about 8 cups of boiling water over the bag to sparge, and again pushed the bag against the side of the kettle until it was dry. Now it was ti me to add the dried malt extract (DME), hops, and gypsum. We tore the DME bags open and slowly stirred the contents into the wort. I'm not going to lie, at first it seemed like getting that much dried malt to dissolve in a little less than two gallons of water did not seem possible. But, I trusted in my recipe and went ahead and added the two ounces of Northern Brewer hops and the two teaspoons of gypsum and turned up the heat to get everything to a boil. Once the heat came up and approached boiling, with the aid of some rather stern stirring, the DME started to dissolve nicely. Once it was boiling, there were a few times where the wort threatened to boil over the kettle, but judicious stirring and removing the kettle from the heat kept everything inside the pot. 60 minutes of boiling, and a beerish odor to saturated the entire house, then ensued. Toward the end of the boil, we prepared a cup and a half of boiling water in my measuring cup and allowed it to cool to around 105 degrees. It took a little longer than we had expected to cool, so next time we'll have to start this earlier. Once it came down to temperature, we added the yeast, covered the cup with foil, and let it rehydrate for about 20 minutes. 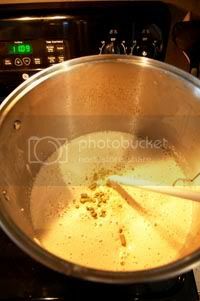 About one minute before the boil was over, we added the Cascade hops (they smelled excellent), as per the recipe. Then, we took the kettle off the heat, and put it in the kitchen sink, along with as much water and ice would fit. We started to cycle the water out of the sink, replenishing it with fresh water and ice every five minutes, and the temperature dropped slowly, but surely, to 100 degrees after 30 minutes or so. Once the wort had cooled, we added two gallons of chilled drinking water to the fermenter, and began to strain the wort into the fermenter. It took about ten minutes, stirring the contents of the strainer occasionally, to transfer all of the wort to the fermenter. 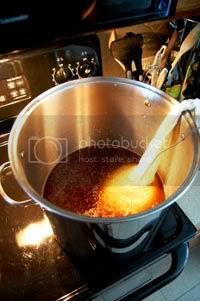 At this point, we poured about 6 cups of hot (but not boiling) water into strainer to sparge off what we could. Then, we topped the fermenter off to five gallons with the rest of the chilled water. At this point, the temperature was at 72 degrees, and we took a sampling and got a gravity reading of 1.065. The yeast was ready to pitch, so we went ahead and added it, and proceeded to put the lid onto the fermenter. We then put the fermenter in it's new home for the next week or so, in the spare bathroom's bathtub, and attached the bubbler. Everything seemed to go rather smoothly this time, and the contents of the hydrometer sampler that I sipped actually did taste a little like an IPA, so there's a lot of hope for this batch. I checked on the bubbler this morning, and I'm happy to report that it's already showing plenty of activity. Now, once again, we wait. If you'd like to catch up on the first batch, Young At Heart Stout, you can read about Phase One (Brewing) here, Phase Two (Bottling) here, and the review of the finished product here. Don't worry about using PBW. 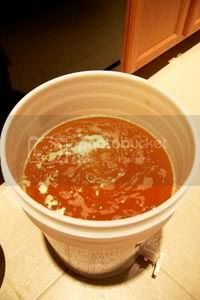 Everything is going to be fine and you should have an excellent batch of beer when the fermentation is complete. My best advice to you from a homebrewer's standpoint is to let that beer stay in the fermenter for at least 14 days and as many as 21 days. The only other note I see would be to start your yeast hydration around 90 degrees rather than 105 if possible... After you bottle this beer, let it sit for a minimum of 3 weeks before tasting it. If you can stand the wait, I would wait 4 weeks. I would also put back two or three bottles of it to taste 8 months out so you can see how the flavors mature in a beer like this over time. Thank you so much for your advice John. I'm a patient man, so waiting two, or even three weeks, to bottle is possible. I've heard before that leaving the beer in the fermenter for a long time is good, but what would you say are the specific benefits? I'm doing well not obsessing too much about the risk of infection, but it's a valuable lesson learned for next time. 105 did seem a little high to me, but it was what Papazian recommended, so I went ahead with it. I'll hydrate them a lower temp next time. You can't go wrong with anything Charlie Papazian says. He's a great source and I have his books as well. I'll definitely give it plenty of time in the fermenter. If I end up waiting over two weeks, I'm assuming I won't have to take multiple gravity readings, and can just take one right before bottling to determine ABV, correct? I do plan on keeping a few bottles to see how it ages over the course of months, even though IPAs aren't typically cellar material. I'll be picking up some Starsan from the local homebrew shop when it's time to bottle. Still can't believe I didn't double-check on PBW, haha. Thanks again for such thoughtful comments, they are much appreciated.